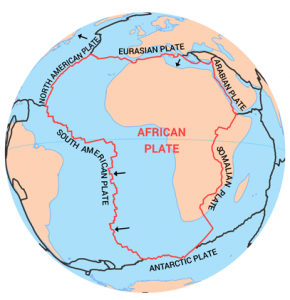 The African Plate is the 4th largest plate tectonic boundary on Earth. Like all major plate boundaries, they’re odd because they consist of both continent and ocean crust. For example, the African major plate contains the whole continent of Africa as well as the surrounding oceanic crust of the Atlantic Ocean. Plate tectonics are never idle. For example, the African Plate moves at an average rate of about 2.5 centimeters per year. That’s about how fast your nails grow each year. The west side of the African Plate straddles along the South American Plate and the North American Plate. At this mid-oceanic ridge, these two plate boundaries pull apart from each other. This diverging plate boundary creates some of the youngest oceanic crust on the planet. Along the east edge of the boundary, the Somali Plate is positioned along the East African Rift zone. This developing rift zone is gradually separating the east part of the continent. The west side of the African major plate diverge with the North American plate. These divergent plate boundaries forms the mid-oceanic ridges or rift valley. 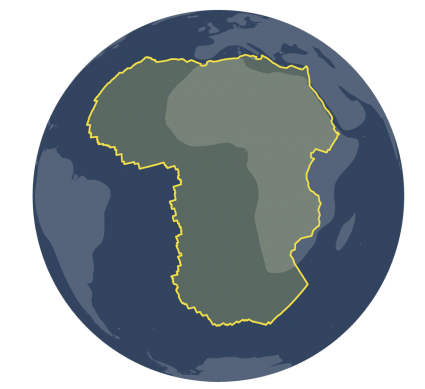 In terms of size, the African Plate is about 61,300,000 km2. This makes it the 4th largest tectonic plate on Earth. If you could rewind time 250 million years ago, this would put you in the Permian Period. In the Permian period, there was just the Pangaea supercontinent. From coast to coast, Pangaea was surrounded by the superocean Panthalassa. Gradually, continental drift tore the supercontinent apart into separate continents. If you were alive in the Permian Period, it would just be stone’s throw away from New York to Africa. Following this period, a rift opened separating the continents of African and South America as Gondwanaland. Then, Laurasia consisted of today’s North America, Europe, Greenland and Asia in the north. 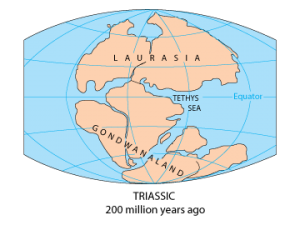 Finally he Tethys Sea separated Gondwanaland and Laurasia in the Triassic Period. If you live in Africa, you probably live on the African plate. But what about every else in the world? 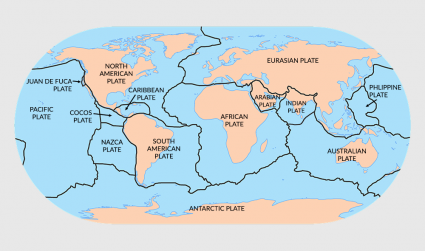 Take a look at the articles for a crash course in plate tectonics.